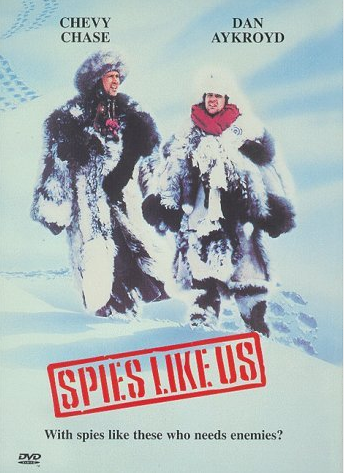 I'm sorry, is this serious business or a remake of Spies Like Us? I've lost track. "We are unaware of any surveillance taking place," says Blizzard. "If it was, it would have been done without our knowledge or permission." But whether Blizzard knew it or not, according to documents from the NSA - published by the Guardian, New York Times and ProPublica as part of the Snowden exposÃ© - that's exactly what the world's spy agencies have been doing since 2008. World of Warcraft, Xbox Live, Second Life, are all known to have been targeted by the world's intelligence agencies. After all, as an NSA document announced in 2008, virtual games "are an opportunity!" In fact, so great was the opportunity that CIA, FBI and Pentagon spooks found to their dismay that they were chasing each other around Second Life, and had to set up a networking group so they could tell the spies from the normals. Meanwhile the UK's GCHQ was busy looking at the World of Warcraft accounts of embassy employees, scientists and other important people, including intelligence operatives of other nations. Perhaps, thought GCHQ, these orcs and night elves could be turned, and used as intelligence assets; George Smiley meets Garrosh Hellscream. The chat features of online gaming really got the intelligence agencies steamed. There was a chance, the spies believed, that enemies could use chat to transmit secret messages, perhaps arranging a terror attack using code words like 'fireball'. Or perhaps the cash economies would be used to transmit funds. Don't worry, it's not just the national security agencies who are spying on you. Specialist outside contractors are hawking their services to the governments of the world. Science Applications International Corporation, aka SAIC, says it can provide "intelligence collection in the game space," and both SAIC and Lockheed Martin have been awarded million-dollar contracts to work on means of spying on MMO gamers. Occasionally the surveillance reaped dividends. GCHQ used Second Life to collect information for Operation Galician, which resulted in the elimination of a London crime ring that sold stolen credit card information within virtual worlds. However there seems to be little indication, from the documents revealed so far, that all this effort resulted in anything substantial. Even when persons of interest were detected playing online games, there seems to have been no evidence that their game habits were linked to any more serious activity.